Would you rather be shot up into the air? Or shot down? 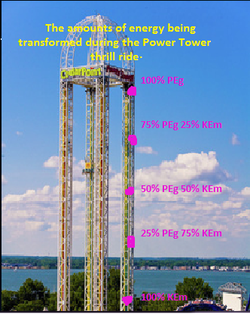 Well you have that choice to make when you come across the Power Tower standing at second tallest and second fastest in the country, located at Cedar Point Amusement Park in Ohio. Two of the carts that you take a seat in to experience the Power Tower, will thrust you up 240 feet at 50 mph or more, high into the Ohio sky, and the other two drop you from that 240 foot point straight to the ground where you first took a seat and began your thrilling adventure. As you are being raised into the air, all the kinetic energy mechanical is being transformed into potential energy gravitational. At the very tip top of the power tower, you are at a complete stop and have 100 percent potential energy gravitational at that highest point. The moment you are released to be brought back down to the ground, you are having energy transformed into kinetic energy mechanical the whole way down until you are at the very bottom. At that point, all the potential energy gravitational is now 100% kinetic energy mechanical. Whichever of the carts you decided to ride in, either the one being shot up or the one being shot down, the energy will be transformed at different rates depending on which thrill you decided to take. How does this ride work? Well it all has to do with compressed air. The air brings the cart upwards at a rate of 12 miles per hour, when you reach the highest point you will be held there for a few moments and unexpectedly the air depresses and you are dropped 50mph with 4.0 G forces hitting you. Most people can only sustain around 5 G forces for a short period of time without having damage done to their bodies, you must be trained to sustain anymore with out injury. Once you reach the bottom of the ride the air compresses shooting you nearly halfway back up the tower for another thrill. It repeats this not gettimg shot up as high as the last each time it is dropped. Soon after the the ride is at a complete stop. If you would like to learn more about how compressed air works, click on one of these sites below!